The December 2017 issue has been emailed/issued to subscribers. The October 2017 issue has been emailed/issued to subscribers. The New Zealand Masters Games is an annual multisport event which alternates between Dunedin and Whanganui. The Otago Community Trust New Zealand Masters Games 2018 will be held in Dunedin from the 3rd to the 11th of February. Marching is a one of the 63 events on offer at the Masters Games. We would like to encourage as many Masters Marching competitors to join us in Dunedin at the 2018 event, and would like to request your assistance in advising your Masters association/members of this event. Any assistance in promoting this event would be most appreciated, whether this is including the event on your website, in any newsletters, in your clubrooms and on your Facebook page. The 2018 event will be held in Dunedin. Attracting over 5000 competitors, they will come from Otago, other regions of New Zealand and overseas. We have 63 events in the schedule offering a full range of sports to participate in for both winter and summer codes. There are opening and closing ceremonies, medals are awarded and with a full entertainment schedule having fun is just as important as the sport. Competitors do not need to be an elite athlete to compete and do not need to qualify. Anyone can register for the Games – whether to win, to beat their personal best or to just have fun. To register or for more information go to www.nzmg.com. In addition we also have a Masters Games Entry Guide which provides all the details on the event. If you would like to receive a copy/copies for your association/club please let me know and I would be happy to forward these through. We would appreciate your assistance in distributing this information to your Masters association/members. If you require any further information please do not hesitate to contact me. Once again, thanks for any assistance you can provide. The August 2017 issue has been emailed/issued to subscribers. The June 2017 issue has been emailed/issued to subscribers. 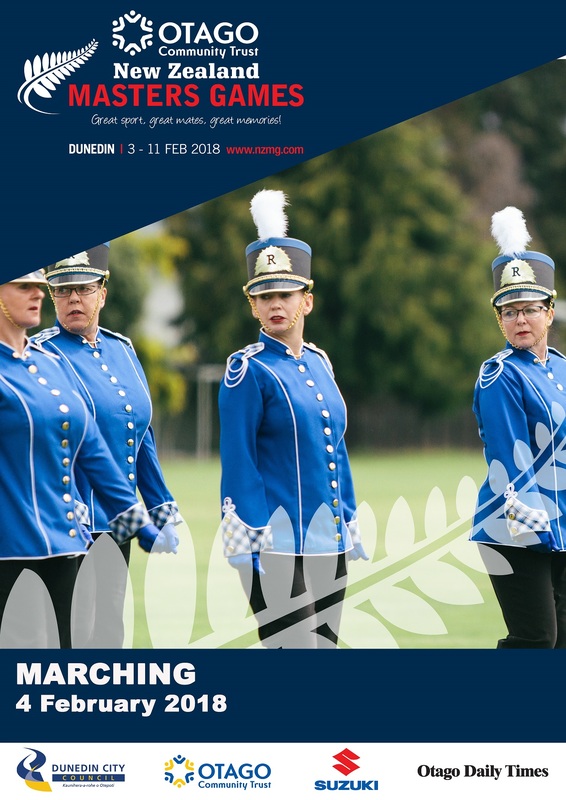 We are busy fundraising to be able to go to Dunedin in March 2018 and march at the Leisure Marching New Zealand event…. 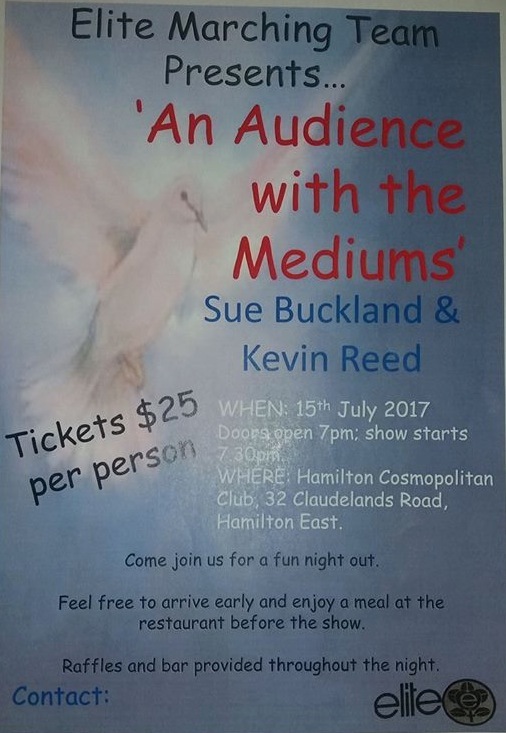 Our team is holding an “Audience with the Mediums” in Hamilton at the Hamilton Cosmopolitan Club and would love you to join us for a night out!!! If you are keen let us know and we will arrange to get tickets to you. Kath Jeffs, Jayne Porter, Gloria Jean Groot Kylie Andrews, Erin Burgess Ashleigh Andrews, Hunter Ward and myself look forward to seeing you all there!!!! The first issue has been emailed/issued to subscribers. After 11 years, the website has now been updated. I hope everyone will support the site, perhaps also with any newsworthy items for publication. Head on over the Contact page, with anything you would like included. I would like to sincerely thank Robin Radford who has done an excellent job over the years! Majestics of West Auckland have new uniforms and their old one is for sale. 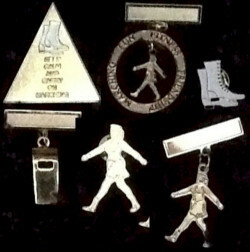 Triangle Keep Calm, Round Leisure & Whistle $10 each, Marching Girls $8, Boots $5. Contact: dawnholmes1959@hotmail.com (or on Facebook). Seek new members to join their team of happy marchers. They are a lovely group of ladies from 30yr to 60+yrs enjoying marching. Please contact Ardell 027 937 4248 or 07 544 1183 for further info.